In the early 1990s, tabloid photographs of pop singer Michael Jackson lying in an unusual glass-encased medical device were published worldwide. There were rumors of a secret anti-aging treatment or intensive oxygen therapy, but in reality the machine was a hyperbaric chamber. Hyperbaric oxygenation is to provide pure oxygen at higher atmospheric pressures, which will be received by the body through the respiratory route, this modality of treatment has become the basic tool for plastic surgeons to handle post-surgical of all kinds of aesthetic procedures for multiple benefits obtained with the method. 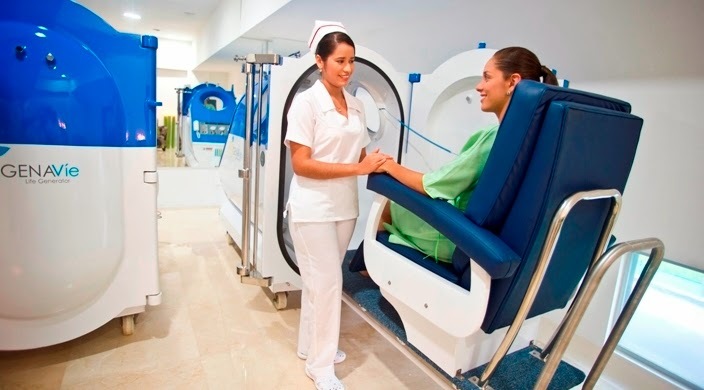 What can we expect to get from Hyperbaric Oxygen? It’s the ideal complement to a surgery, to oxygenate tissues and achieve excellent healing. Because normally we breathe O2 (oxigen) that is low in content and we can magnify it through the hyperbaric chamber. • Improving the quality of the skin for its rejuvenating effect. • Improves the stress of long working hours. • Avoid the risk of infection by increasing the body's defenses. • Strengthens the hair follicle to prevent hair loss. Eliminates muscle fatigue caused by sports overtraining. So especially for clients that travel to Colombia to have plastic surgery we advise to get some hyperbaric chamber sessions, right after surgery, as it helps heal much faster! We from Calibelleza also offer to include them in our all inclusive packages. • Rapid elimination of pain, swelling and bruising. • Accelerates the healing of compromised tissue in plastic surgery. Faster recovery from post-surgical stress. For more information about plastic surgery and beauty treatments; please visit:www.calibelleza.com. And make sure to add some hyperbaric chamber sessions when you come over for your plastic surgery journey.